Hunters’ Bog Trotters take their name from the area of Holyrood Park in Edinburgh known as Hunters Bog, and the club was originally formed from former students of Edinburgh University. The rather whimsical club name encapsulates a lot of the spirit of the club – namely that the sport is not taken too seriously. It has since spread and has an Aberdeen branch as well as the original Edinburgh base. By a possibly happy coincidence the HBT acronym also stands for Home Brew Talk (an actual website)! Some indications of their light hearted approach – they were to my knowledge the first Scottish club to wear war-paint on their faces after the ‘Braveheart’ film took the country by storm – other clubs and runners do it now but it is a bit passé by now, they also listed their teams in a relay not the A team, the B team, etc but their first quartet was the H team, second was the B team and the third squad was the T Team! Ironically at one point they were one of the few clubs to offer serious to the Racing Club from Edinburgh whose raison d’être was to raise the standard of Scottish by forming a winning team: winning was the real and only goal of the club. Two opposites in opposition to each other. Racing Club is defunct, the Trotters trot on. However that may be, Colin Youngson has written the following very good profile of the club. The Trotters origin and philosophy has been described in the profile of one of its fastest athletes, Phil Mowbray (see Elite Endurance). For several years after the club was formed it concentrated on a form of running which emphasised adventure and real ale drinking. Whereas its companion club, Westerlands CCC, took part in the Edinburgh to Glasgow Relay as early as 1978, HBT did not participate until 1984 when it may have finished twentieth but defeated Westerlands (in that club’s last appearance in the competition). The Trotters who featured in this debut performance included the founder, Robin Thomas (pictured above), along with Stuart Gibson, Dave Taylor and Bill Blair. In 1985 (twentieth again) Ian ‘Nixon’ Marshall featured along with ex-ESH gold medallist Craig Hunter. By 1989, with the advent of Par O’Kane, the brown vested army had improved marginally to nineteenth. A hint of future success came in 1990 when HBT won the most meritorious medals after surging up the field to eighth. Stuart Gibson started well in seventh place, then Edinburgh University’s Adam Eyre-Walker (who was to finish third in the 1991 Scottish Senior Cross-Country Championship) and Colin Farquharson maintained that place, Pat O’Kane gained one and passed on to Craig Hunter, Simon Axon (see Fast Pack, Aberdeen AAC), R Elliot and ex-EAC runner Archie Jenkins. After a couple of less successful attempts at the E-G, and strengthened by new Trotters Rob Herries, Hayden Lorimer (future Scottish hill-running champion), Steve Wright and Robert Brown, HBT were eighth again in 1993 and sixth in 1994. They improved again in 1995 with Phil equal fastest on Six. 1996 supplied the first E-G medal for Hunters Big Trotters when they were third. Archie Jenkins, Jeff Pyrah, Colin Farquharson, M Thomson and Ian Harkness moved upo to seventh, and then Phil Mowbray (fastest on Six), W Grant (fastest on Seven) and Pat O’Keefe (second fastest on Eight finished strongly. HBT were sixth in 1997 (with Donald Naylor third fastest on Two and Pat O’Keefe fastest on Six), eighth in 1998 (Phil Mowbray best on Six), and in 1999 were again third. Farquharson, Naylor, Lorimer, Harkness, Alistair Hart, Mowbray (fastest on Six), Dave Wright and Gary Brown were the bronze medallists. After a fourth place in 2000 (Ian Harkness fastest on Five, Phil Mowbray on Seven), the Trotters finished second in 2001, agonisingly close to winning the Edinburgh to Glasgow. Alistair Hart was first on Stage One and Stevie Cairns fastest on Two, Dave Wright passed on to John Heapo who was fastest on Four as was Ian Harkness on Five. At the start of Stage Six Phil Mowbray’s lead was only ten seconds and after a tremendous battle with fellow GB International Glen Stewart (Mizuno Racing Club) he ended up one second behind. Don Naylor ran the fastest on Stage Seven to reclaim first, but Hayden Lorimer wass outpaced by Davie Ross of Mizuno and ended up only fifteen seconds down. Still – a fantastic performance – HBT were more than seven minutes clear of Shettleston in third. The final E-G in 2001 produced fourth place for the Trotters, despite fastest times for Ian Harkness on Five and Phil Mowbray on Seven. However, as the club’s name suggests, Trotters tend to specialise in tougher underfoot conditions, although they did finish second in the 2004 Scottish Six-Stage Road Relay (with Cairns,Mowbray, Billy Minto, Hart, Dave Wright and Ray Ward). In 2005 HBT won the Scottish Cross-Country Relay Championships (Cairns, Hart, Naylor, Mowbray) and two years later came third in the same event (Murray Strain) Ward, Hart and Cairns). The greatest triumphs for Hunters Bog Trotters certainly came in the Scottish National Senior Cross-Country Championships with victories in 2001, 2005 and 2007, as well as bronze medals in 2002 and 2009. Gold medallists were Don Naylor, Steve Cairns, Phil Mowbray, John Heap, Ian Harkness, Alistair Hart, Ward and Strain. Bronze medallists were Dave Wright, Gary Brown, James McMullan and Craig McBurney. 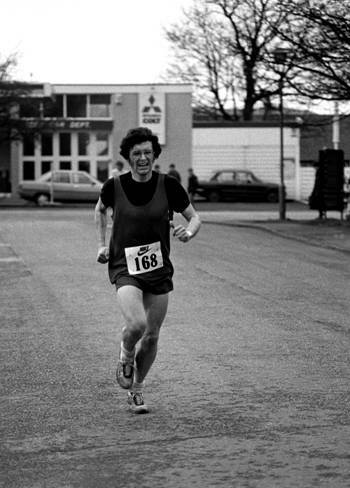 Colin Farquharson first ran the Edinburgh to Glasgow for Clyde Valley in 1977 (see Fast Pack: Clyde Valley) and won Scottish team titles with them before injuries began to hinder his running. He ran for Aberdeen AAC in the 1985 Edinburgh to Glasgow but the Aberdeen branch of the HBT was formed and Colin, a free spirit, was a natural to join that club. As has been mentioned above, he wore the brown vest with distinction and contributed to medal-winning performances as well as social highlights. He ran the very last E-G in 2002 – 26 events after his first appearance. In 2001, when HBT won the National for the first time, Colin was seventh man home for the club (and they would still have won the title if he had been their last counter), it was only right that the triumphant team photo showed Colin Farquharson holding the trophy. Donald Naylor, from Swansea, continues to have a very impressive career. His track bests include 3:46.9 (1500m), 13:58 (5000m) and 8:37.35 (3000m steeplechase). Apart from his cross-country feats, Don is a GB INternational steeplechaser and competed for Wales in the 2002 Commonwealth Games in Manchester where he finished sixth in the steeplechase. In 2004 he won the New Zealand Championship in that event, and also the Inter-Counties 5000m. At the age of forty in 2012 he still managed to finish twenty second in the Scottish National Cross-Country. Gary Brown who had track bests of 1:47.15 (800m) and 3:42.66 (1500m) represnted Scotland in the 1994 Commonwealth Games in Victoria. Alistair Hart became Scottish 5000m champion in 2000. Ian Harkness is the course record holder for the famous Black Rock 5. He has completed the Two Breweries hill race and was part of the HBT team that triumphed in the 2002 Isle of Man Easter Festival of Running (and fast pint drinking). David Wright won the Isle of Harris Half Marathon in 2004 and the Stornoway Half Marathon in 2010. Stevie Cairns from Northern Ireland and Annadale Striders, continues to race voraciously. He was Northern Ireland steeplechase champion and the Scottish Cross-Country champion in 2004 over the 4K distance. Stevie has also won the Scottish Police cross-country championships and the UK Police steeplechase and 5000m. Since becoming a veteran he has run very well in the annual British and Irish Cross-Country International where he frequently spends time socialising with the Scots (as well as the Northern Irish of course). Ray Ward ran 1500m in 3:50. After his track career he turned to the roads and has won the Newtonmore 10, the Edinburgh to North Berwick 20 and the two island half marathons, in Harris and Coll. James McMullen is a GB International hill-runner and in 2011 became Commonwealth Mountain Running Champion. Craig McBurney from Morpeth is coached by the great Jim Alder. He finished second M40 in the 2009 Scottish Masters Cross-Country and has taken part in the annual British and Irish International. Murray Strain the current club captain, is obviously talented and versatile and continues to improve. Like many Trotters he previously ran for Edinburgh University. His first sport was Orienteering and he ran twice in the World Championships. Murray has won the British Elite Sprint Distance Championship. He is a prominent 10K road runner and in 2012 won the Great Scottish Run at that distance. In 2011 he became the Scottish Hill-Running champion and has competed internationally for Scotland. In 2012 Murray Strain won the Snowdon International, and ran well in the gruelling Jungfrau Marathon, and the Sierre Zinal. A recent recruit for Hunters Bog Trotters is Joe Symonds who in 2012 finished ninth in the Scottish National Cross-Country and went on to win the British Mountain Championships (Short Category). He is of course a GB International hill runner. The Hunters Bog Trotters saga continues! There are lots of very interesting and talented athletes in the Trotters Roll of Honour. The range of abilities that have come together in the club is very wide indeed – outstanding track runners who have competed with distinction at many major Games in events as far apart as the relative sprint of the 800m and the technicalities of the steeplechase., very good hill runners who have run for Britain as well as for Scotland, Orienteers and road runners aplenty. What has drawn them to Hunters Bog Trotters? Probably the mix of the sport itself, the club philosophy that ‘losing isn’t the end of the world’ and good company. Of course, success helps, whatever they might say. The whole thing, started by the man at the top of the page, Robin Thomas who was at one time President of the SCCU. In your more philosophical moments, as a runner, you could do worse than raise a glass to Robin!